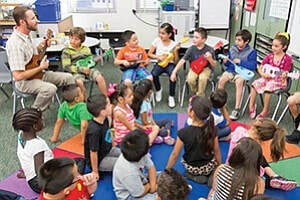 GITC Classrooms Are Receiving Ukuleles and Musical Supplies Thanks to Funders through DonorsChoose.org! recent article about how music helps students acquire literacy and language skills. in schools across the nation! The Coast News of Encinitas and the North County coastal area caught wind of the GITC programs that took place this school year on a grant from the Coastal Community Foundation's Betty Scalice Fund. Local trainer, Stephanie Lewis and executive director, Jess Baron worked in tandem to train 45 teachers who were for the most part, new to GITC this year. Here's a terrific article that gives some organizational history written by Bianca Kaplanek. Just "mouse over" the link below and click to read it. Education writer for the Del Mar Times, Marsha Sutton visits GITC in Solana Beach, California and reports on the start of new programs. March, 2017 from the South Whidbey Record on Whidbey Island, WA. San Diego Business Journal reported on GITC winning a $15,000 grant from the Cax Cares Foundation. Learn about the specifics of the GITC approach and how music connects with academic teaching and learning! May, 2012, read about our work in South Carolina directed by Dr. Joan Maute! ​we got our own 501(c)3 designation.